Sliced from the face of the earth as if for dermatological biopsy, Maisel’s photographic portrait of the waters and surrounding lands of the Great Salt Lake are as much oncologic as ecologic, his camera lens, from thousands of feet above the land, seeming to corkscrew down impossibly upon it. Attaining a scale of seeing that is at times almost cellular—where the surface of the earth is examined like soft tissue—his subject area might just as easily be bounded within the circumference of a petri dish as the four thousand square miles of saline water, evaporation pools, and perimeter lands that actually comprise his field of view. Our vision thus compressed and contained (if viewing several square miles within a single image can be called contained), a marvelous thing transpires: the entire image-field tips up and forward, the great horizontal stretches of salt water and chemical flats vaulting to the vertical, suddenly inhabiting the space and conditions of a painted canvas, the world of Rothko, Diebenkorn, and Kiefer. For a pilot, the effect is almost jarringly physical. Maisel achieves this vertiginous equivocation—between true altitude and radical proximity, between wide-angle optics and macroscopic affect, between the horizontality of flatbed terrain beneath our feet and the vertical stance of art before our eyes—in several ways. 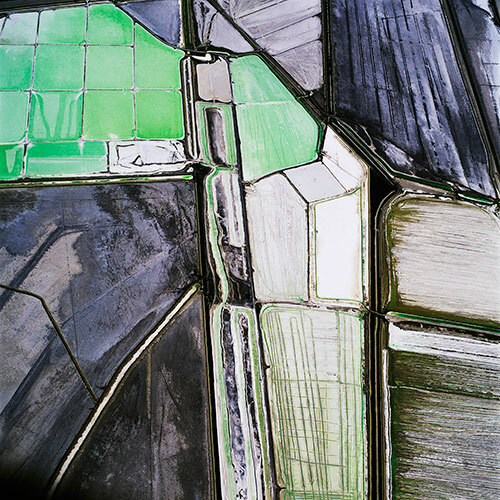 Although aerial—and within a great arc of environmentally engaged (and sometimes aerial) photography that includes Richard Misrach, Edward Burtynsky, and most notably his eminent professor at Princeton Emmet Gowin1—the Terminal Mirage series is distinguished by a fact quite extraordinary for landscape photography: without exception, the horizon line is always absent from within the frame. If the horizon is foreclosed in Terminal Mirage, so too almost every other suggestion of perspectival depth is denied. Only one image, Terminal Mirage 26 (page 193), contains any clear visual indication of receding space as we move from the bottom of the image to the top. Here we see a grid of storage bunkers—from the Tooele Army Depot, about twenty-five miles southwest of Salt Lake City, which is our national treasury for expired chemical weaponry, where, encased within these innocuous-seeming igloo bunkers, rests some thirty million pounds of powerful nerve agents. The grid of igloos creates orthogonal lines. But even then, Maisel refuses to line them up with the edges of the frame, but rather twists and tilts them in plane. That particular piece of land is about as dead flat as land gets. But in Maisel’s framing, it tips and lifts disconcertedly, destabilizing the spatial envelope. Indeed, the Terminal Mirage pictures are notable in that they systematically lack every single device commonly used in landscape photography to establish depth, distance, and spatial orientation. The atmospheric haze that dulls objects in the distance, wrapping them in a thin blue veil? There is none of that here. Instead, the blues and blue-greens we see are the signature colors of molybdenum and magnesium, or the lovely aqua-green hues of the salt-loving phytoplankton Dunaliella viridis, all of which are part of the Technicolor stew of minerals and algae that concentrate in the landlocked waters of the Great Salt Lake.3 Directional shadows, foregrounded trees, convergent lines of roads and fences disappearing into the distance? Almost totally missing in action in these works. And when they do appear (roads meeting at right angles, straight tracks, shadowed structures, such as Terminal Mirage 6, page 175), these potential space makers are quickly absorbed within the all-over abstraction of the picture plane, their effect more important for establishing scale and distance than spatial orientation. There is almost nothing in these works to establish the familiar landscape tropes of foreground, middle ground, and background. So, what does all this horizonless discombobulation mean? First, a simple observation: These images are the opposite of the bird’s-eye view that makes up the overwhelming majority of landscape photography, which is to say the great vista (landscape or cityscape) as seen from on high. The sky (and your presence in it) and the receding distance (and your liberated capacity to move across it) are part and parcel of the framing and inherent geometries of the traditional aerial view. But not in Terminal Mirage. In talking about his work, Maisel sometimes quotes Wim Wenders, who in his book The Act of Seeing suggests that “the most political decision you make is where you direct people’s eyes. In other words, what you show people, day in and day out, is political.” If where the artist points our eye is meaningful, then so too is the act and action of the framing process itself. In the process and methodology of framing the shot, we can also locate motivation and meaning. While this is easier to discern in moving pictures—video quickly lets us know whether it was captured with a static tripod shot, a shaky handheld shot, or an eerily fluid, godlike, gyro-stabilized dolly shot—by inference a still image also reveals much about its making. A horizon line that is askance to the upper edge of the image implies a snapshot provisionality, the sense of an unfolding reality and immediacy implicit in handheld camera work. A blurry stationary object implies the point-of-view is in motion. An infinite depth-of-field implies sequential compositing, computer manipulation, and all the refined optical staging and sense of stop-action psychographic delay that implies. And all these different modalities of camera work impart meaning, just as the subject matter and its ultimate framing impart meaning. If Maisel’s Terminal Mirage images are the opposite of conventional aerial views in their relationship to the horizon, spatial orientation, and movement, then what are they? To a pilot’s eye, it’s alarmingly obvious that many of these images were composed during moments of exaggerated, one-wing-high maneuvers, radical yaw, and steep tumbling turns of a kind that fill an airplane’s windshield with land, not sky. In short, these photographs are taken not only looking down but during actual moments of stomach-flipping spiraling descent and tightly banked, aggressively acrobatic turns that are absolutely foreign to the typical aerial photograph. I’m a pilot, and I came to Maisel through flying. On a long solo trip home to New England from a quixotic trip to the Burning Man festival in the Black Rock Desert region of northern Nevada, I happened to fly over several large open-pit mines and was mesmerized by what I saw. Their vastness—a scale of operation so big it was as difficult to absorb as the immense rugged openness of the Western deserts themselves—took my breath away. The beautiful, self-referential internal logic of their excavation, conceived and executed with a hard-headedness and lack of affect that reminded me of Donald Judd, made me want to photograph them and make a book. Back home, five minutes of online research relieved me of the need, since I quickly discovered that Maisel had already done it, and far more exquisitely than I could have ever dreamed. Coming to Maisel through flying is not essential, but it is illuminating, especially for the Terminal Mirage series, which has so little to do with conventional aerial photography and the way the world looks from above. As William Fox has written about so engagingly,4 there is an almost primitive urge among humans to see the world from on high and to capture it in imagery. The skillful rendering of bird’s-eye views employed whole flocks of artists in the nineteenth century. With the invention of the camera and its mating with kites, hot-air balloons, fixed-wing aircraft, helicopters, and gyroscopic mounts, an entire new genre of photography was born. And in almost every one of these images (with the exception of military surveillance imagery and the satellite views made so familiar through Google Earth, which are unrelentingly downward), the terrain and built environment are rendered as if our passing beyond is imminent . . . 45-degree oblique angles, the earth spreading out before the eye. But with Terminal Mirage, there is none of that feeling of lateral possibility, of spatial continuity beyond the frame. With no indication of moving across the terrain, no out, no up, no air, the only alternative is harrowing. There is a saying among pilots, “Keep the blue side up,” because when your windscreen fills edge-to-edge with brown, it means the aircraft has assumed—in the deadpan right-stuff language preferred by pilots—an “unusual attitude.” Unusual attitudes are to be assiduously avoided, unless you are a stunt pilot. When learning to fly, much training time is spent in unusual attitude recovery. Terminal Mirage is a catalog of what unusual attitudes look like from the air, writ large and all the more destabilizing to one’s psyche because they are so deliberately beautiful. In Terminal Mirage 45 (page 191) and Terminal Mirage 8 (page 190), for example, trapezoidal evaporation pits set up visual forces that are almost centrifugal in feeling, a feeling trebled in Terminal Mirage 13 (page 183), which even features its own internal set of Aresti-like markings.6 In Terminal Mirage 21 (page 171)—a particularly striking image of the dioxin-rich wastewater ditches of the Magnesium Corporation of America7—the staccato dashes and incised hyphenations are good visual stand-ins for the chaotic moment at which straight and level flight breaks into inverted spin. And in all of them, the blossoming onrush of frame-filling land leaves a pilot flush with dread, the spiral dive, caught in a moment of torqued stop-action, feels like death foretold. This is not the landscape of the German immigrant Albert Bierstadt (see figure 1, page 160), who turned his eyes upon the western tracts of nineteenth-century America and saw in them the sweeping grandeur of a fresh national soul in formation—land as providence and fateful future—but rather of a later Düsseldorf-trained artist, Anselm Kiefer (see figure 2, above), who depicts land as the concatenation of history tainted, his charred, ashen, thickly painted surfaces, packed with mud, straw, and clay, tipped up to become one with the plane of the painting. Emersonian passage by Smithson, whose writing and land works are a source of inspiration to him. Smithson proposed building viewing platforms in abandoned mines, to confront viewers with the fact of deeply cut earth. Analogously, for the site of his Lake Project, Maisel has similarly proposed a theoretical plan to construct an observation tower on the edge of the Owens Lake flood zone, with a bridge crossing the section of the lake where bacteria stains the water blood red, bringing viewers in close physical proximity to the toxic reality of that massive human-made environmental disaster, which is still unfolding today a hundred years after the lake was destroyed in pursuit of water for Los Angeles. The kind of visceral, corporeal insertion of one’s self into the strangely lifeless-seeming biomass of the Great Salt Lake—and the equation of the Great Salt Lake to blood itself—is captured in an homage to Smithson taken by Maisel in 2003 (see figure 3, Terminal Mirage 15, left): with an almost X-ray-like graphic elegance, Maisel renders Smithson’s spiral jetty as a sort of intrauterine device, the saline crystallization of the jetty rocks vivid against the menstrual hues of the lake. Within the grand sweep of American landscape photography, Ansel Adams celebrated with relentless zeal the miraculous lands and natural formations of the West. Robert Adams mourns and records their loss even while finding solitude, and pictorial possibility, in the very fact and visible trace of their former existence. It is not so clear to me, however, that Maisel leaves much room for redemption in these images of Terminal Mirage. The downward spiraling and otherworldly hues feel terminal indeed. Unless, of course, Schjeldahl is right, and the kind of jarring beauty that Maisel wrests from toxicity shifts the way we see and think. By auguring our view so violently and pitilessly down upon these surfaces of cankered earth, there resides the prospect, however remote, that Wenders might also be right, and something like initiative or political agency could somehow emerge from such gloriously rendered scars. Of course, art has often been the site of political projection. Maisel’s work, however, suggests a convergence of aesthetic and argument that refuses polemics, providing us instead with a beautiful and deathly surface where important contests might play out. And in the meantime, art alone will suffice. 1 Maisel also flies in the wake of West Coast postwar aerial photographer William Garnett, in the footsteps of the US Geographical Survey landscape photographers William Henry Jackson and Timothy H. O’Sullivan, and—aesthetically and politically— in the tradition of the New Topographic photographers, the group of artists interested in human-altered landscapes (including, for Maisel especially, Lewis Baltz) presented in the milestone exhibition at the George Eastman House, organized by William Jenkins in 1975. 2 The exceptions that prove the rule are Terminal Mirage 1, 8, and 24 (pages 169, 190, and 181), from the plates presented in this volume, and 7 and 62 from the series as a whole, all of which reveal the slightly oblique angle from which they were taken. Maisel uses a hand-held camera for his aerial photographs, and he always displays the images so that the top of the framed image corresponds to the top of viewfinder. So, when pointing his camera straight down, there remains a “top and bottom” for the image, even though the top may not necessarily correspond to “up,” if “up” means toward the horizon and sky above. 3 Besides these, and sodium, the long list includes potassium, chloride, and sulfate, all of which are “mined” by means of evaporation ponds that line the Great Salt Lake’s shores. Maisel likes to point out that these are also the essential chemical elements of photographic chemistry. 4 William L. Fox, Aereality: On the World from Above (Berkeley: Counterpoint Press, 2009). 5 From Allison N. Kemmerer, John N. Stilgoe, and Adam D. Weinberg, Reinventing the West: The Photographs of Ansel Adams and Robert Adams (Andover, MA: Addison Gallery of American Art, 2001), as quoted by Jock Reynolds in his excellent essay, “Above the Fruited Plain: Reflections on the Origins and Trajectories of Emmet Gowin’s Aerial Landscape Photographs,” in Jock Reynolds et al., Emmet Gowin: Changing the Earth (New Haven and London: Yale University Press, 2002). 6 The Aresti symbols are a sort of choreographic shorthand used by aerobatic pilots to describe and record stunt-flying routines. 7 These toxic pits, where the levels of dioxin were reported in the 1990s to be some 170 times the EPA allowable limit, are just one link in a chain of pollution of considerable magnitude, which once included the release of some one hundred tons of chlorine per day into the atmosphere from its stacks, visible across hundreds of miles and accounting for the majority of all chlorine gas emissions nationwide. After a federal lawsuit was filed against MagCorp in the late 1990s, claiming nearly $1 billion for environmental infractions, the company filed for bankruptcy protection. U.S. Magnesium, a new company, now operates the plant and has radically reduced its emissions of chlorine gas. (The Center for Land Use Interpretation, http://www.clui.org/ludb/site/magcorp-magnesium-chloride-plant). 8 Peter Schjeldahl, “Notes on Beauty,” as quoted by David Maisel in his lecture “Rendering the Invisible” for the Penny W. Stamps Distinguished Speaker Series at the University of Michigan, Ann Arbor, February 10, 2011. 9 Robert Smithson, “The Spiral Jetty” (1972), in Robert Smithson: The Collected Writings, ed. Jack Flam, (Berkeley: University of California Press, 1996).